If more places could pay the bills by offering only desserts, NYC would be a much happier place. Of course most restaurants offer arrays of decent desserts, but there is a giddy, child-like feeling in visiting a decadent dessert destination. Our hands-down favorite is The Chocolate Room in Park Slope (another location in Cobble Hill). 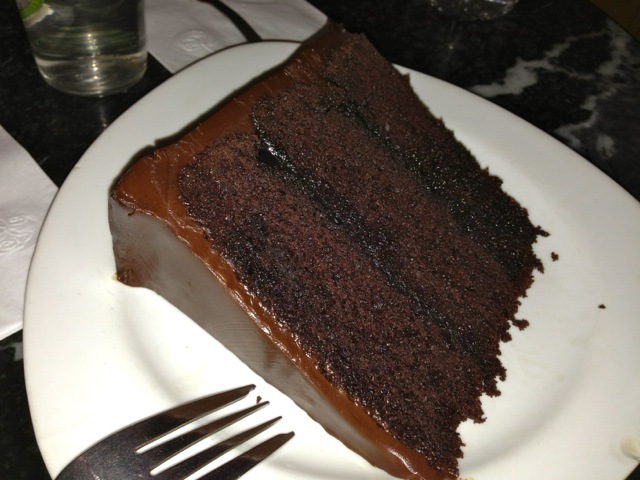 The Chocolate Layer Cake is OUR FAVORITE in NYC! It is a 3 layer blackout cake ($6.50) that is just perfection. It is perfectly moist and has just the right balance between cake and frosting. Go for the cake, but stay for The Brownie Sundae ($8.95). A warm, fresh brownie with your choice of homemade ice cream, hot fudge, fresh whipped cream and a brandied cherry. It is amazing! The Chocolate Room is classic perfection. There are more cutting edge desserts shops, but go here for the desserts you really want. Be a kid again and give in to your chocolate cravings.